I'm excited to bring you a graduation party from Michele who's friends with Fizzy Party on Facebook. 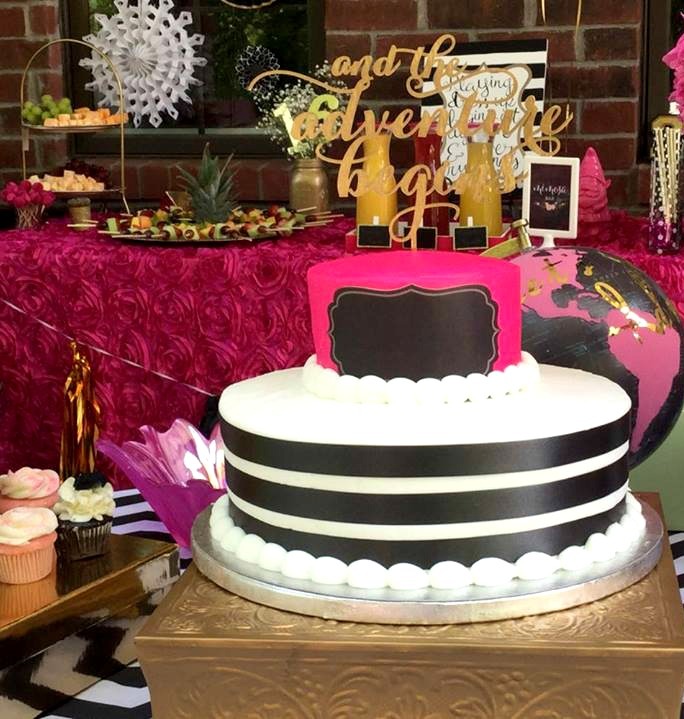 Michele messaged me about something she saw on my page and we got talking parties, of course ;) She sent me a picture of the graduation party she threw for her daughter and I loved it. She did a great job! So she sent more pictures and I said, that needs to go on my blog!! So here it is. Michele's daughter graduated 4th in class, woo hoo!! and is off to study chemistry so she can go into the medical research field. Now that's something to celebrate about. I love the POP of pink from that table linen. Michele bought her's but you can also rent beautiful table linens. Michele can get a lot of use out of this pretty pink table linen. 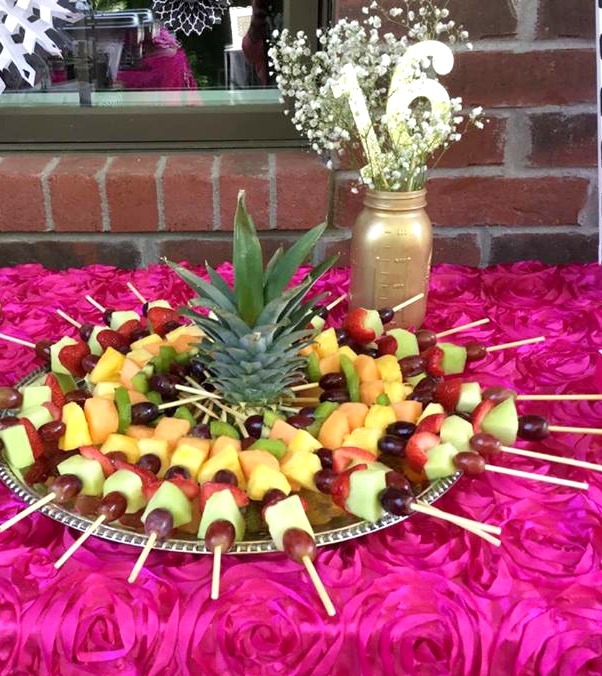 It's great for Valentine's parties, Easter, anniversary parties, Mother's Day, girlfriend luncheons, and pink parties. See those cookies and chocolate covered Oreos on the black and white table. Keep reading to see why they're so special . 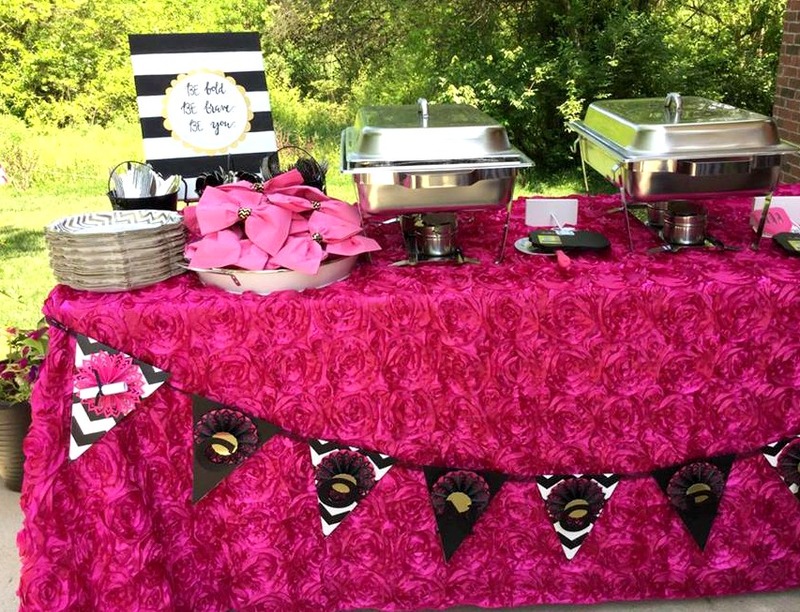 Setting up a buffet is great for family parties. As the hostess it leaves you more time to enjoy the party. I love the touch of the diploma scroll on the banner and how Michele incorporated the colours and patterns of the tables into the banner. 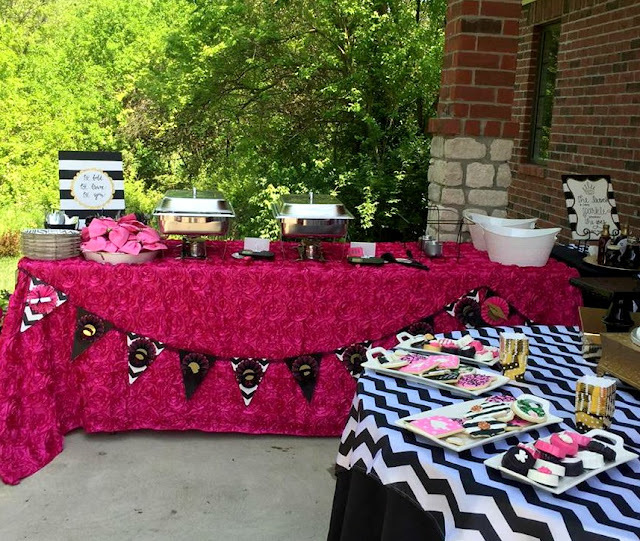 By doing this she tied the main food and dessert table together. Sometimes paying the extra expense for a tent is a good idea. If you live some where hot a tent helps keep your guests cool and from becoming sunburned. 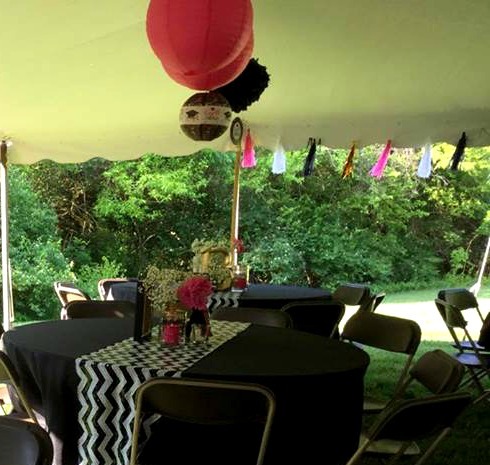 Table and chair rentals are fairly inexpensive and worth it for a large party. Pretty way to display fruit. I like the touch of the pineapple top. Remember those cookies from the beginning of the post? Here's a close up. The reason these cookies are special is because Michele made them! 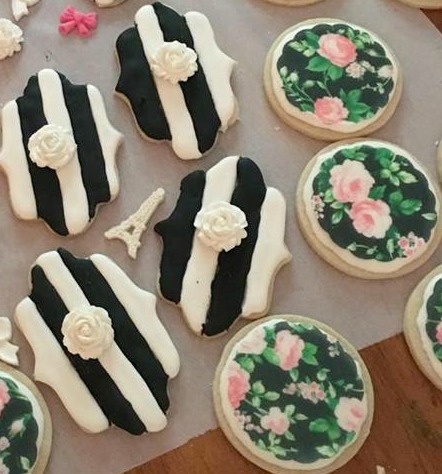 She said she spent weeks creating these fancy sugar cookies and even made chocolate covered Oreos. Way to go Michele!! Party props to you. 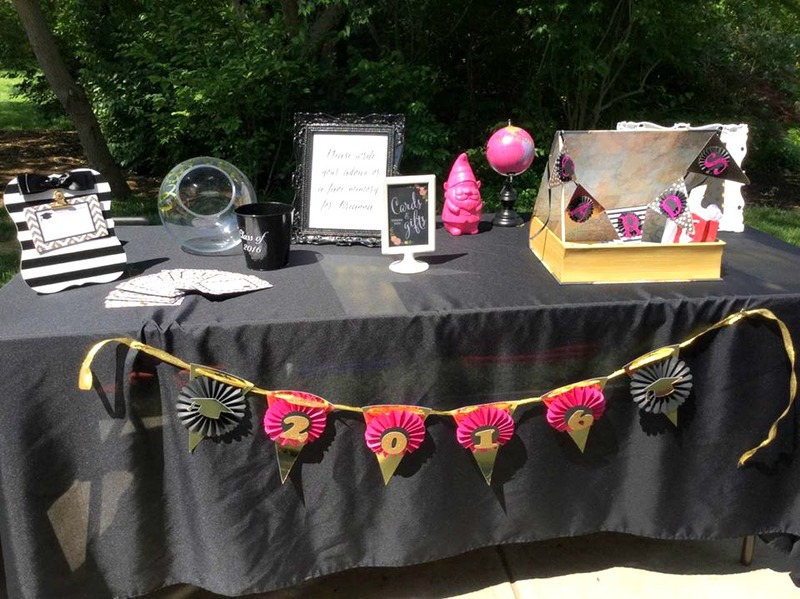 I love that pink gnome on the card/gift table. Great job Michele!! Thank you for letting me share your party. 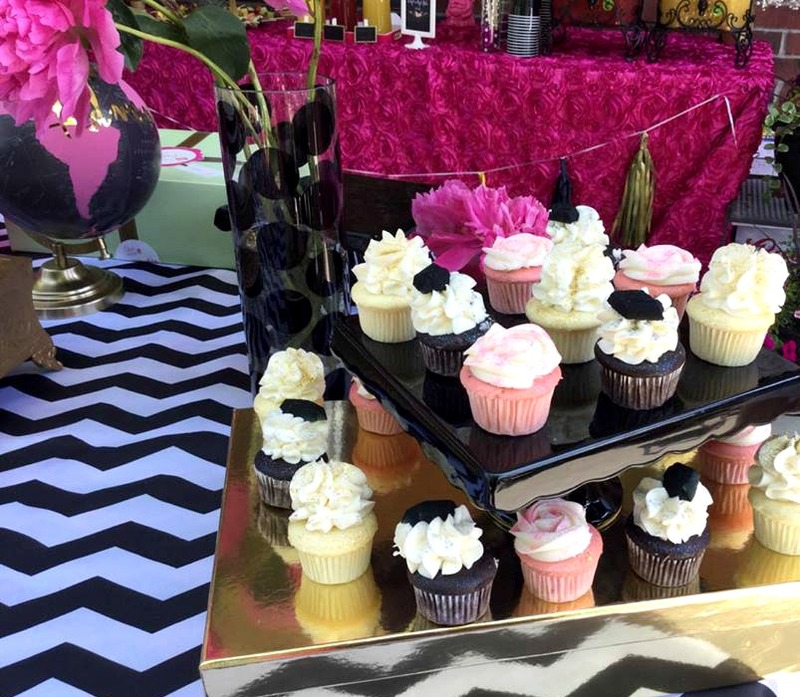 You make me want to throw a pink, black and white party. Do you have a party you want to share? Tell me about it. What a great party! One of my favorite color combos: hot pink and black/white stripes! I agree Donna. Michele did a great job. And that is a hot colour combination. It pairs so well together.